The Pots from our own firing a week or so ago have all been cleaned and sorted out now in the spare-time that we can find between weekend workshops and work in the garden and orchards. We forwent the leisurely mushroom, egg and bacon brunch and got stuck into cleaning pots early instead. There’ll always be time for that leisure day sometime in the future – when I find myself bored and with nothing to do! Janine got some really nice little cups with dramatic carbon sequestration and loads of natural ash deposit all over the fire-face. 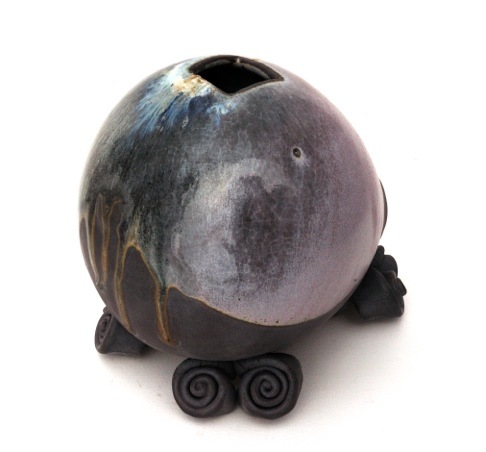 The clay body flashed red and the carbon inclusion is dark charcoal grey and black. A really lovely dramatic result for her. I think that they are stunning little gems. 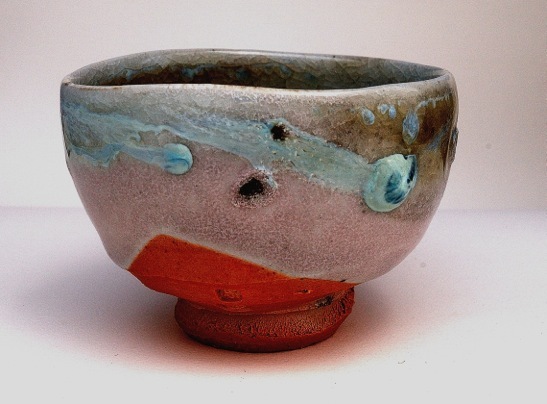 She has used one of her older North coast, wild beach, pumice glaze. It varies from batch to batch, just as ‘wild’ glazes should. Varying from pale green celadon-like, through darker bottle greens into this transparent ‘honey’ brown on this occasion. It’s a complex function of the natural variations of the materials, where they are collected and how they are processed, but also what they are blended with and in what proportions, plus the firing and the wood. I love this unknowable and unpredictable quality, so have absolutely no intension of trying to regulate or control this wild beach girl. 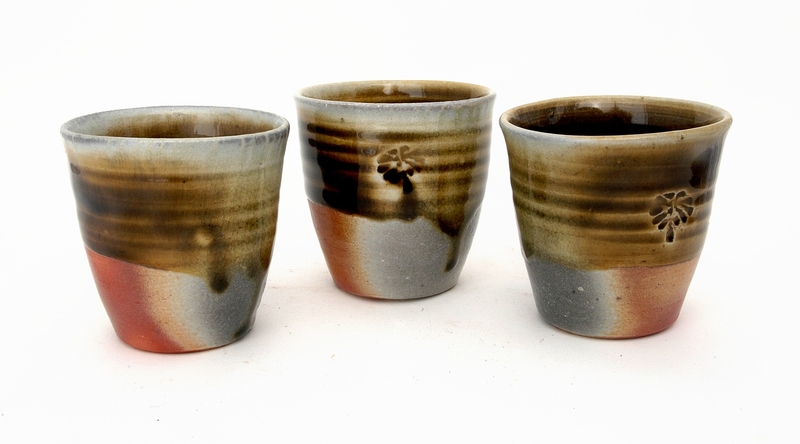 I love the way these little cups have flashed to a lovely warm red and yet picked up so much grey carbon during the firing, making for such a great contrast. 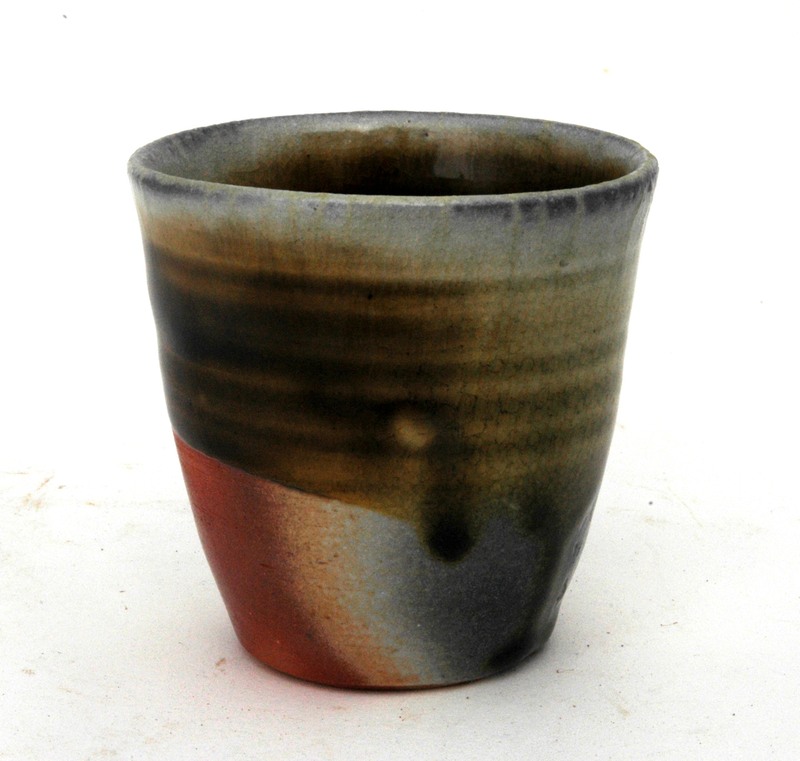 Some of these cups are so grey with sequestered carbon, that it makes them look as though they are on a dark clay body. but they’re not. In fact they are only glazed to half way, and the wood ash during the firing has glazed them all over in some places. 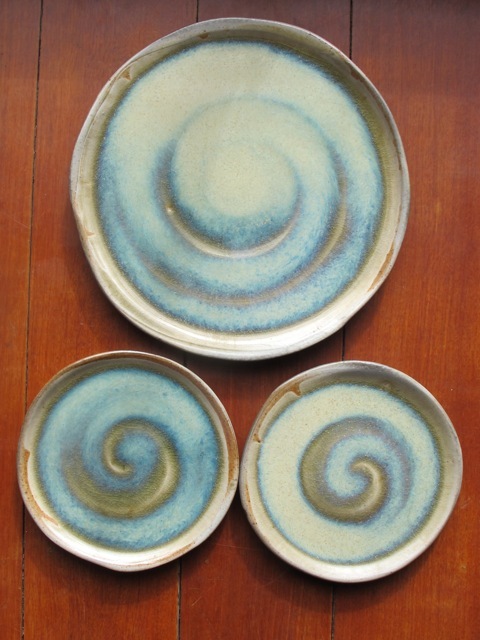 I have some nice rough country kitchen plates, glazed with the fluid blue/cream ash glaze. 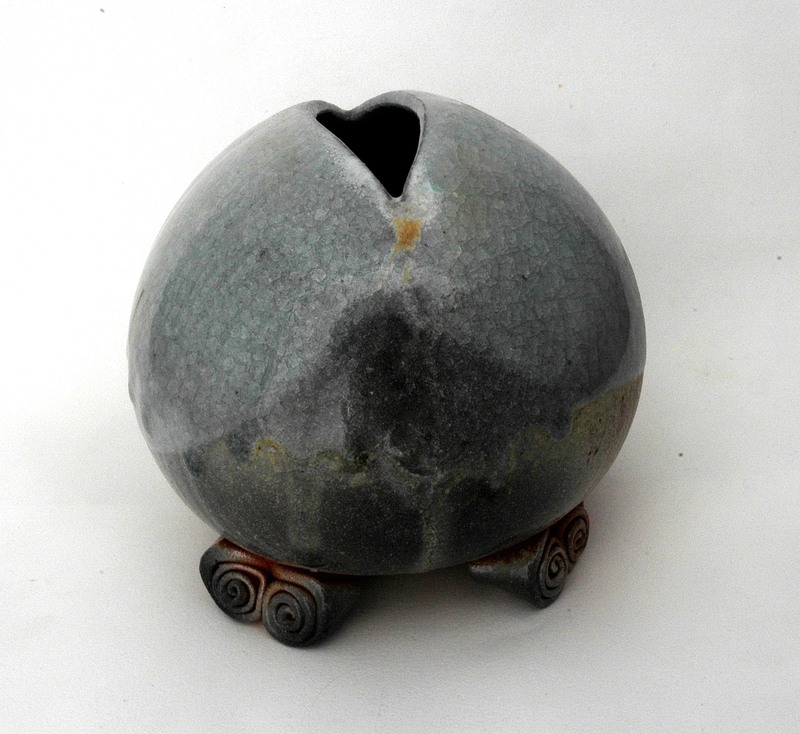 Some very nice ikebana vases fired in the front of the kiln in the ‘Zone of Death’ for the exhibition in Taiwan and three lovely tea bowls for the exhibition in Singapore. 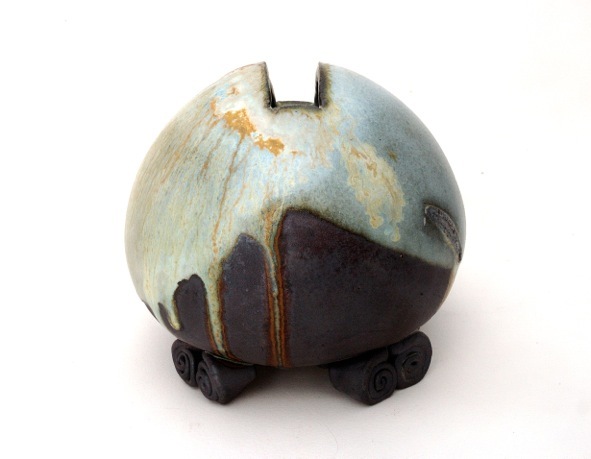 Plus two nice faux shino tea bowls for a group show at Kerrie Lowe Gallery in Sydney. So the pressure is off. I have everything that I need and more. This life of self-reliance and DIY seems to have worked out OK for us. However, it’s a bit late now after almost 40 years together and living here to go back and make any changes. We have committed to this life and it has been good to us. The ash glazed plates will mostly go into use in our kitchen, but there will be a few for sale in the pottery and on our ‘Gallery’ menu on the blog, when I get around to it. I threw them with a feeling of being fast and loose so that the throwing marks are quite distinctive. They were actually thrown reasonably slowly, I just wanted them to look ‘fast’. 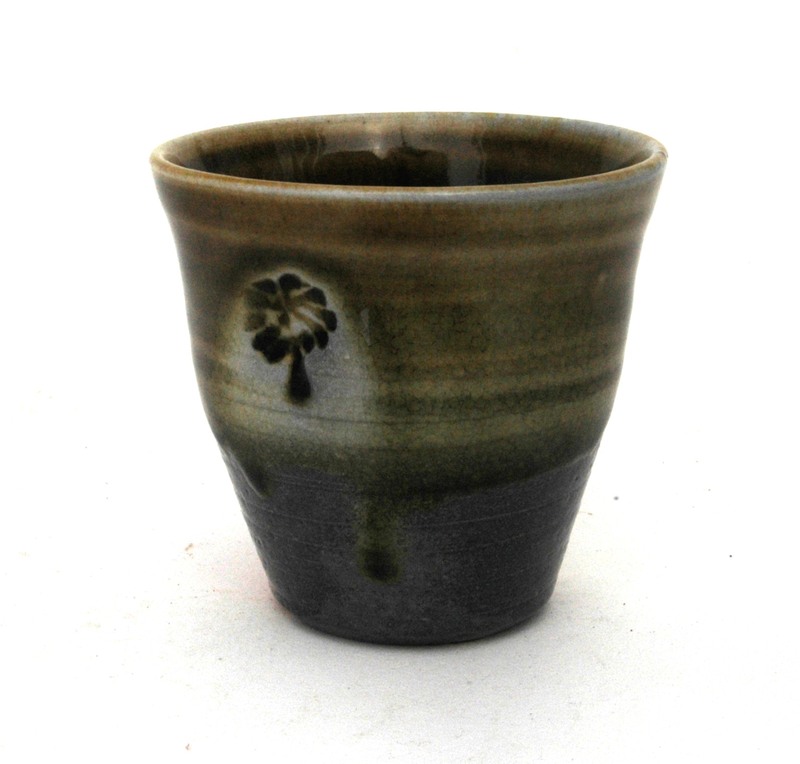 This was to show off the pooling effect of the ash glaze at high temperature. They have turned out well and I’m happy with them. I wrote about making them 6 weeks ago in ‘Give Peas a Chance’, when I was throwing them. There is an inevitable time lag between throwing the wet clay on the potters wheel, drying it to leather hard ready for turning the bases into a smooth shape and creating a ‘foot’ ring, if required by the form, then thoroughly drying them out before bisque firing. The biscuit firing is heated slowly up to 1000oC in the solar powered, electric kiln. 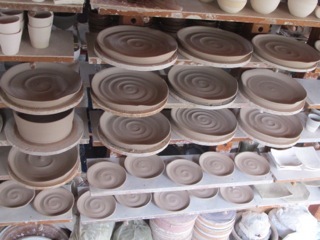 Then after slow cooling, the pots are unpacked, fettled and prepared for glazing. The water based glaze mixture is made from sieved wood ash from the kiln and/or kitchen stove firebox, mixed with ground up local stones. 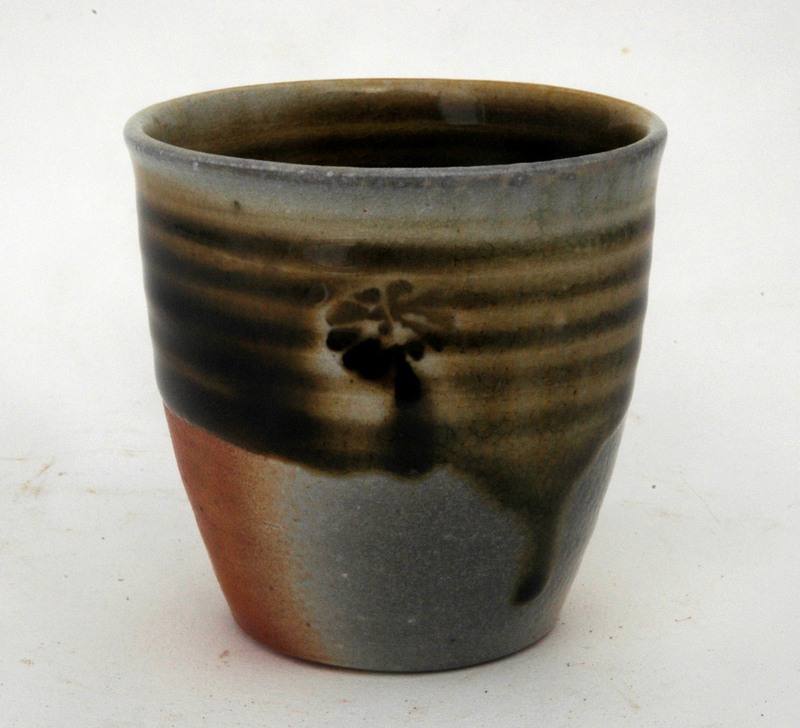 In this case the application is quite thick because the glaze runs and pools at high temperature. After the glaze is dry, the pots are packed into the wood fired kiln to be heated up to 1300oC in reduction atmosphere over approximately 20 hours of constant stoking. It’s amazing that potters will actually come here to work through the night firing the kiln with us and be happy for the experience! Potters?!! The pieces below were in fact fired in my own firings, squeezed in-between the regular weekly workshop firings. These 3 Ikebana vases have come from the kiln looking pretty good. I’m very lucky! They all say wood fired, but they are each different in their own way. The first 2 are made from my washed basalt gravel sediment paste body. Black and mat and exerting a strong influence on the glazes that I apply over them. 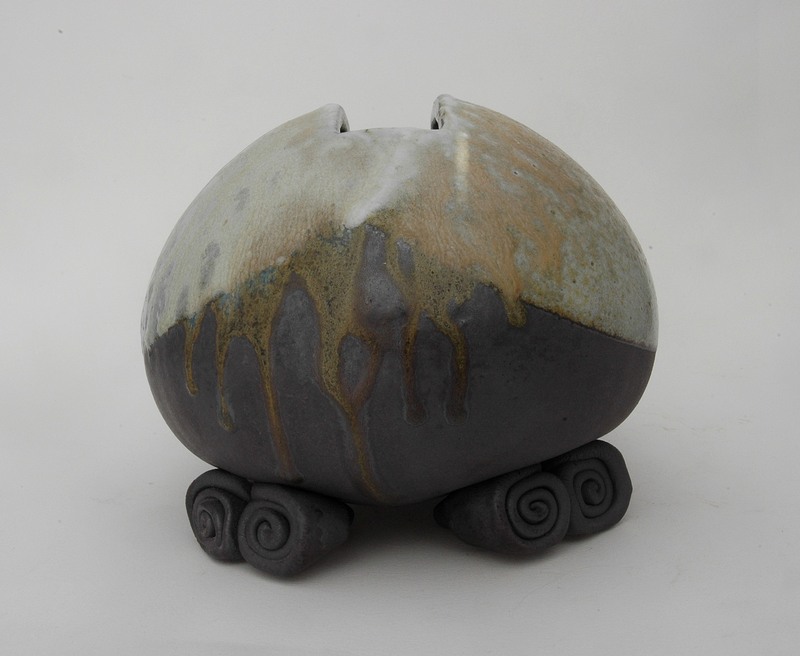 The 3rd from red flashed stoneware that has picked up a lot of carbon inclusion during the firing. I made a number of these vases, so I have a few to choose from. I will put these others up in the gallery. 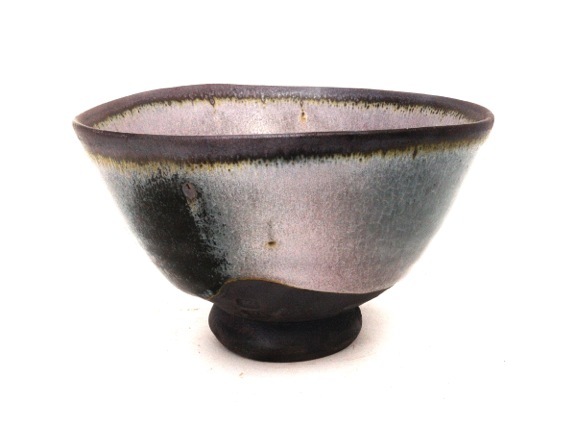 The tea bowls that I have selected for the exhibition of ‘Chawan’ in Singapore are a mix of shapes and styles. 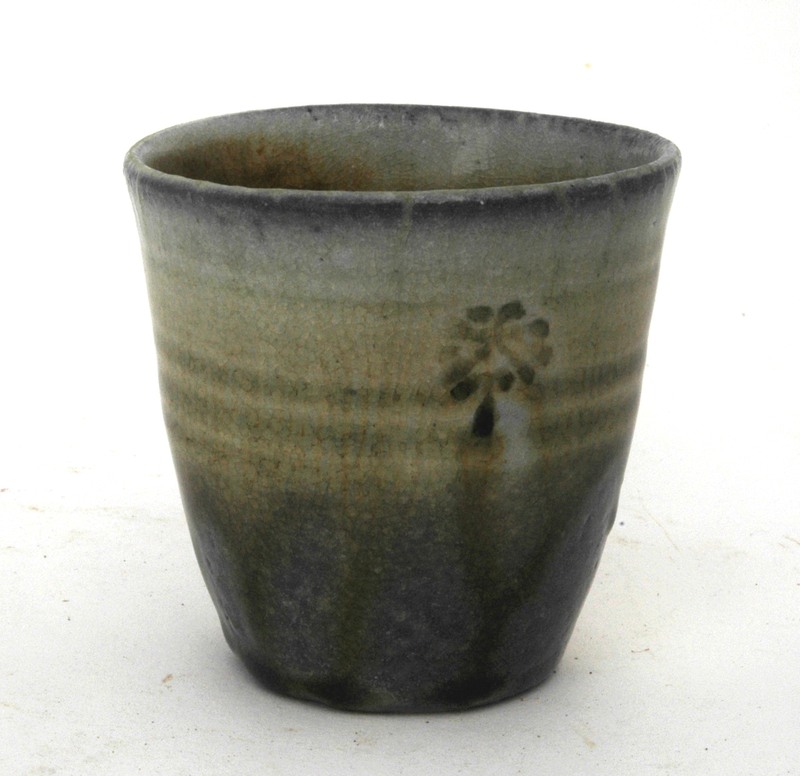 This bowl is of the more open ‘summer’ style of tea bowl. It is gently undulating with a softness of form and surface, but with superb strength of character. It speaks quietly but looks as if it knows something about a big stick. It is made from my washed basaltic gravel sediment body paste. It is very unusual. It fires dark charcoal grey to matt jet black. The extraordinarily high iron content makes it quite tricky to fire to high temperatures in reduction without melting it. When it survives, it is amazing. I love it. The body seeps its iron into what ever glaze is covering it and it changes them. 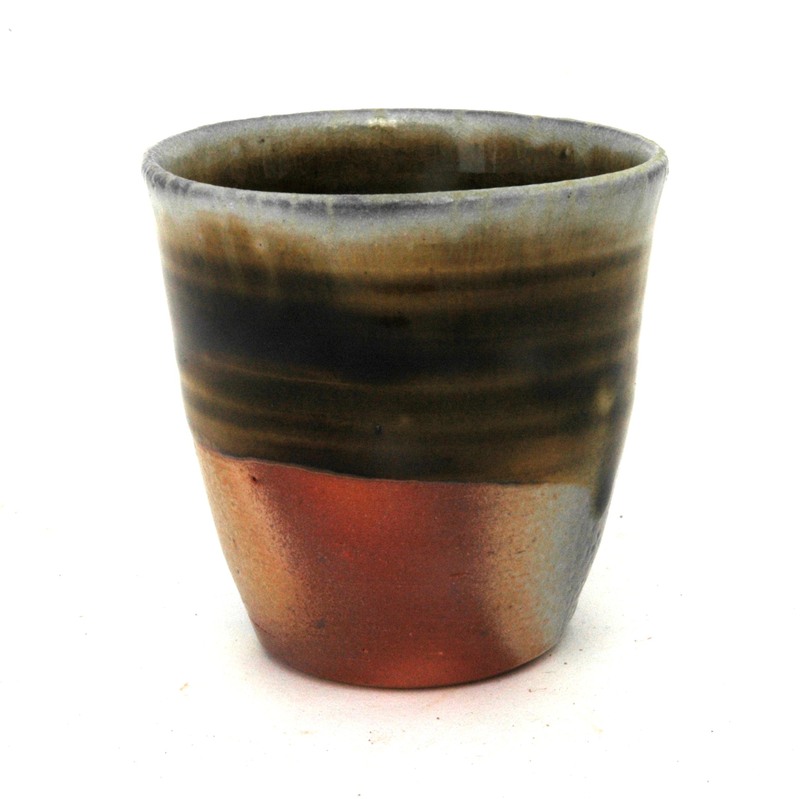 In this case the glaze is an ash and rock combination that fires to a mushroom pink colour, with hints of grey and chocolate. 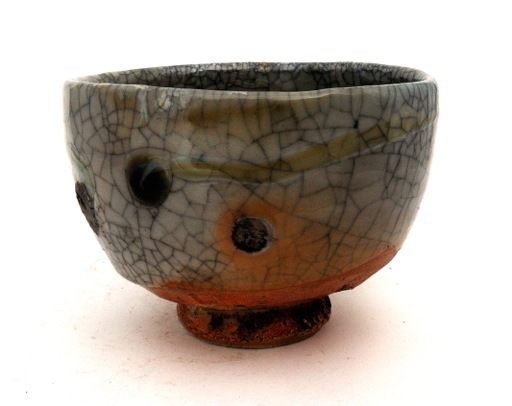 Where the wood ash from the flame during firing impinges on the surface, it can bleed into the glaze base and turn it transparent so that the black body underneath is revealed. This bowl was very fortunate in the kiln. 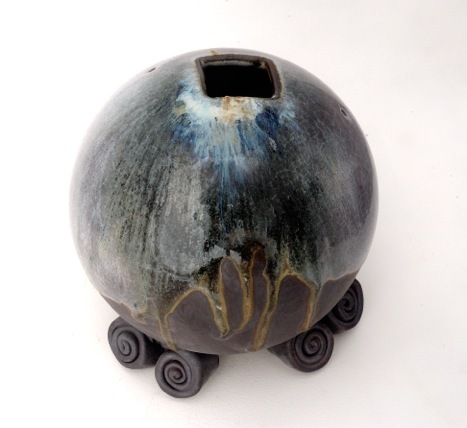 It was enhanced beyond what I put in the kiln, through the firing experience and emerged with a range of surface colours from matt pink to perlucent grey through to transparent black. 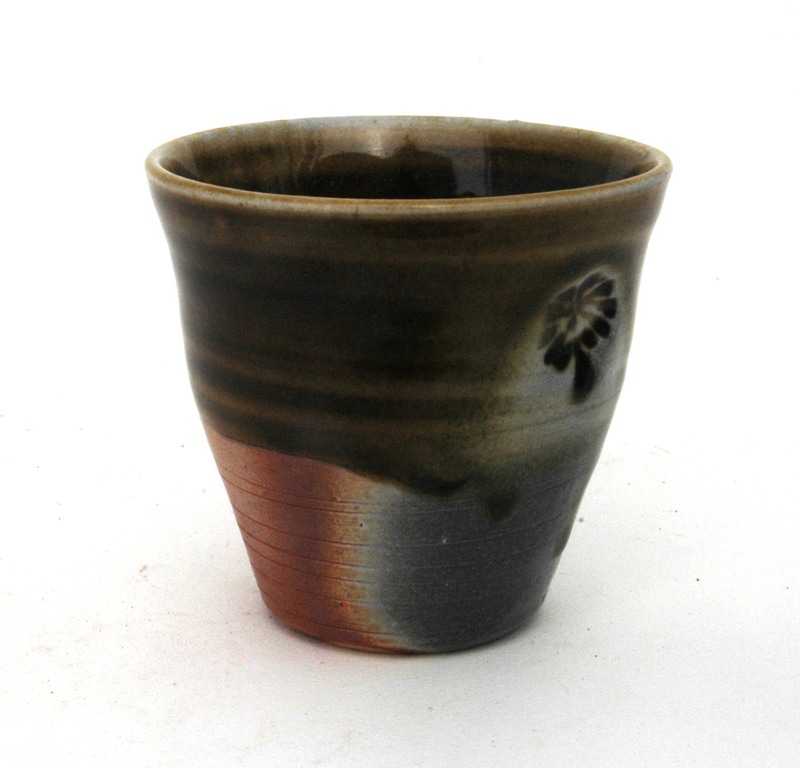 The rim shows a saturated iron chocolate brown, where the glaze has run away from the rim during firing. The surface exhibits four seasons, dry matt black, clear glossy transparent black, soft satin pearlescent blue/grey and densely matted soft mushroom pink. I love it! This bowl although new, looks old. It has had a tough short life and shows it experiences clearly on its surface. However, it still carries itself with grace and poise, despite its scars and marks of surviving the experience of the firefront. A bit like life. It has superb strength of character. 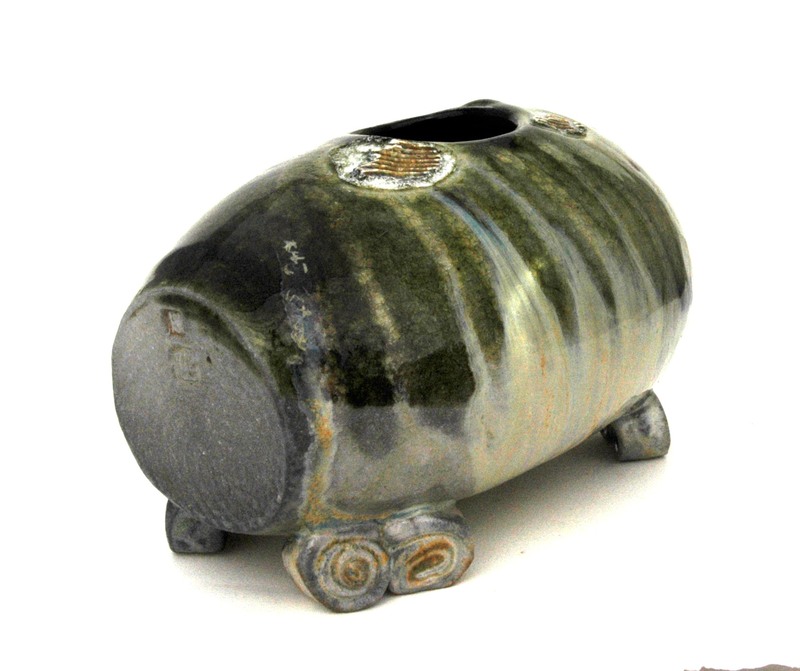 A strong, beautifully textured foot that illustrates the roughness of the clay beneath, while draping itself in a luxuriously soft, satiny, pink/grey cloak of wood ash and granite glaze, with highlights of runny pale blue opalescent ash glaze. It’s a closed ‘winter’ bowl and feels wonderful in the hands. This ‘winter’ bowl is glazed from my local native ‘bai-tunze’ porcelain stone body, converted to a glaze by the addition of our local limestone deposit and a small amount of ash. 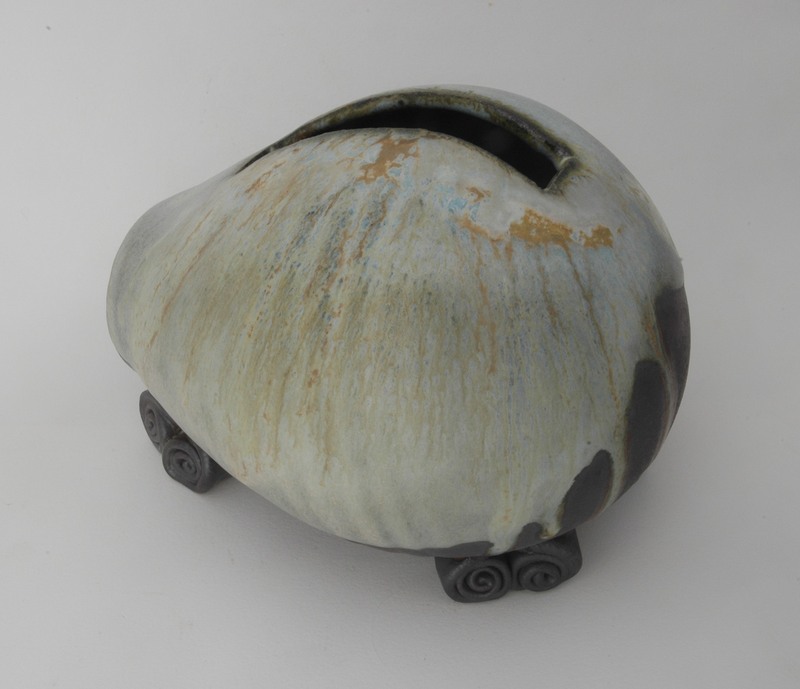 The resulting glaze is of the ‘guan’ / ‘celadon’ family of glazes. it is pale blue/turquoise green where it is applied thickly over a pale clay and a more sombre grey where thin. 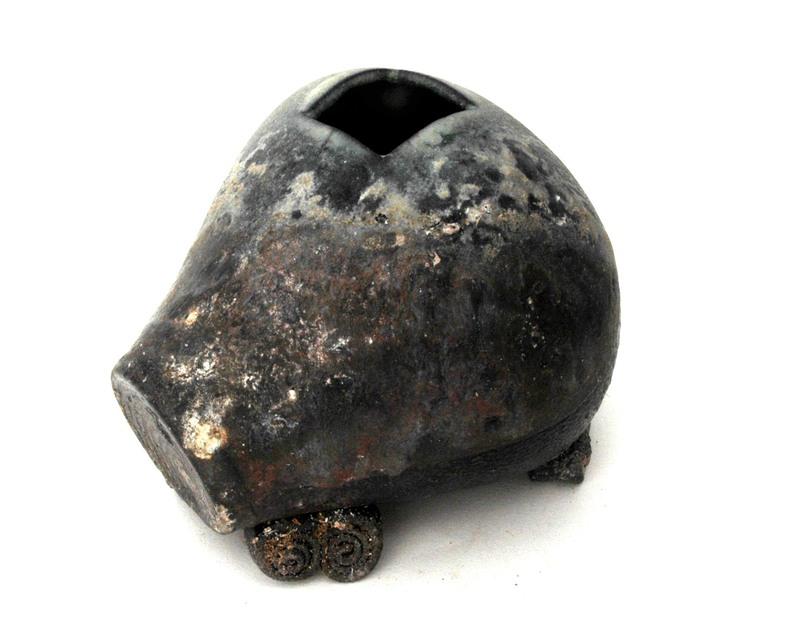 this stoneware body has a small amount of iron present, just enough to colour the clay grey in reduction with a charcoal carbon inclusion where it is exposed directly to the wood fire flame. 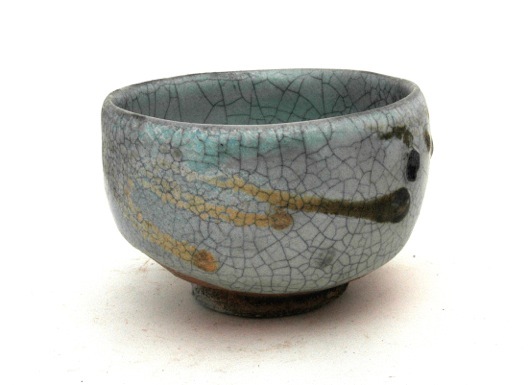 the ash that has melted over it during firing varies from golden yellow to mat brown and contrasts beautifully against the thicker turquoise glaze on the rim. It has a quiet contemplative feeling and a subtle restrained beauty. I’m quite happy with these three different bowls, made from 3 different ground or washed rock bodies and with 2 different wood ashes and ground rock glazes. 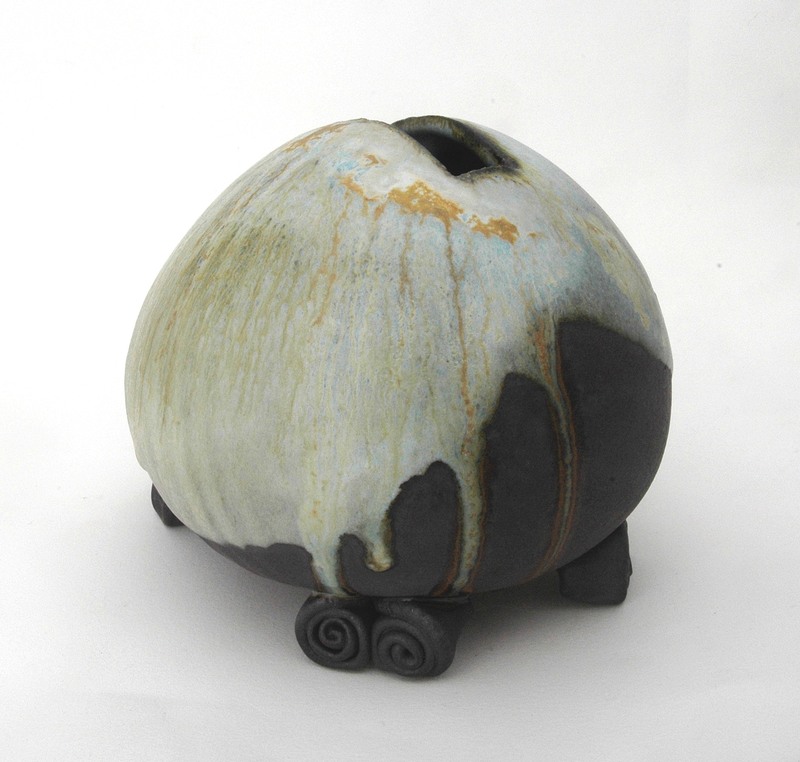 This next bowl is a response to some wonderful work exhibited by Toni Warburton, where she re-imagined traditional grey shino with a completely contemporary take that involved making grey shino images, textures and colours at earthenware temperatures. These were ceramic paintings/sculptures that imaged the aesthetics of the old wares. They were exhibited at the Australian Ceramics Assn. exhibition; “The Course of Objects – The Fine Lines of Enquiry”. I really liked this work very much. I couldn’t have thought in this way. But, once having seen it, it spurred my imagination. I’ve always had a reluctance to try my hand at shino. It’s been so overdone and especially by wood firers, and why not? it’s an amazingly good and ever so attractive glaze surface. But, exactly because everyone is doing it, or has done it, it suffers from over exposure. I don’t want my work to be indistinguishable from everyone else’s. I really admire the original pieces made in Japan in the Mino area in the last two or three generations by Arakawa and his followers and imitators. If Shino is what happens when you take the local stone and apply it over the local clay, then that might have some area left to be explored here in the Southern Highlands and its surrounds. It won’t be shino, but it will be one of the local aesthetic variations that are possible to conceive of in this place, at this time. I decided to try my local granites. aplite, porphyry and other acid volcanics and their derivatives, just to see what would happen. I even drove out of my shire to access some acid volcanics next door. I’m thinking that if I apply this simple formula of ‘use what I have’, then do the best that I can with it. I just might get something interesting. So this is what I have started to do. I don’t know what I’m doing with shino, I’n a novice, but I know my materials, so something has to happen. Let’s hope it’s good. 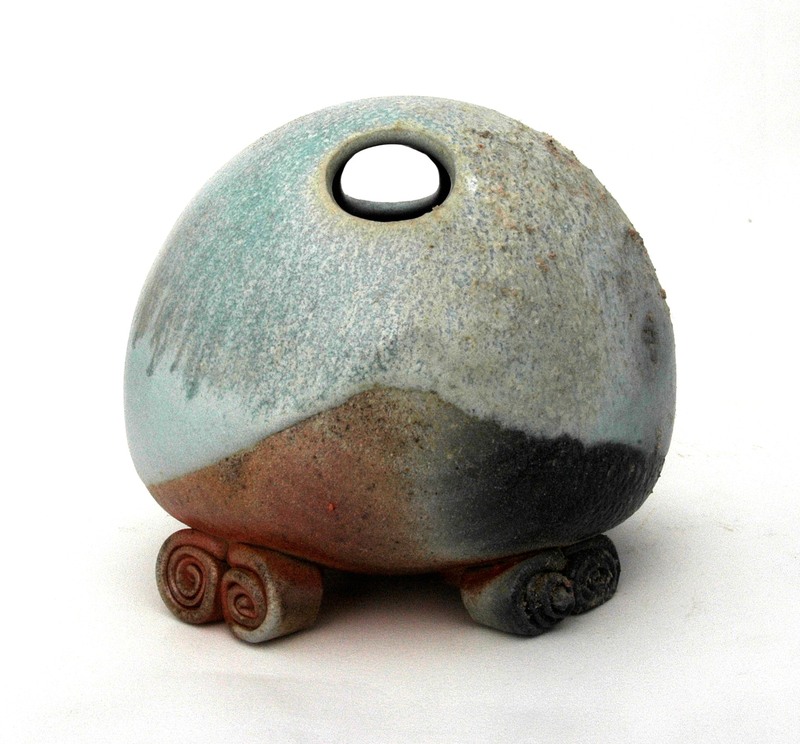 This winter bowl was fired in the ‘Zone of Death’ at the front of my kiln firebox. It’s blushing with embarrassment at being so lucky to have survived the ‘zone’ in a first attempt at Faux Shino. I think that there is a bit of potential here. This new work will be shown at the Kerrie Lowe Gallery in Newtown in a few weeks time. Best wishes from the slow moving Faux Peasant and his Wild Beach Girl. 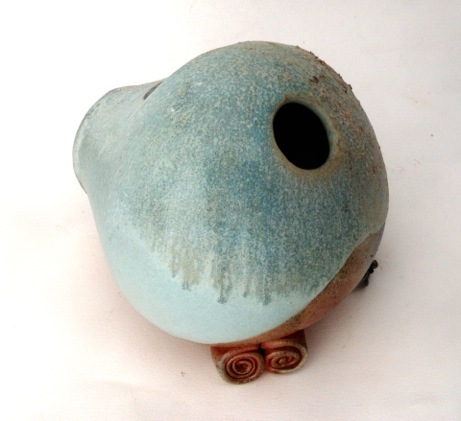 This entry was posted in In the pottery, kiln firing by hotnsticky. Bookmark the permalink.